The C-Eye is a programmable, stand-alone solution for a wide range of vision applications: machine vision; check ID marking; pattern recognition; industrial process control; motion position detection; security monitoring. Fully C/C++ programmable, the C-Eye can act as QVGA/VGA black-white, RGB, YUV CMOS smart camera. 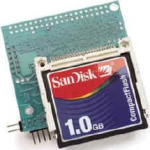 Supports logging to PC-compatible file-system through integrated CompactFlash interface (up to 4 GB). The TERN C-Eye controller is an innovative new solution for a wide range of vision applications: machine vision; check ID marking; pattern recognition; industrial process control; motion position detection; security monitoring. The C-Eye is the ideal board for adding low power standalone digital image acquisition and recording to any embedded application. CMOS image sensors have become widely used on platforms like cellular phones, or PC/Web-based remote cameras. However, these cameras generally rely on a connection to other central systems for data storage, image processing, or power. The below images are from actual Windows-readable image files captured using the basic C-Eye product (w/ CF interface) under normal lighting conditions. Provided sample program demonstrates how to capture such images at any interval into onboard CompactFlash. The onboard CMOS image sensor has 640*480 active pixels. With a pixel clock of 20 MHz, the hardware frame capture period is approximately 40ms (allowing ~25 fps acquisition). Real-time images captured is made available to the user-application at a peak rate of 10 fps, and indefinite acquisition/processing (including storage to the CompactFlash card) is possible at ~3-4 frames/second. On the C-Eye platform, images are captured via two simple C function calls. Data is available to the application with full resolution, and full color/grayscale detail (1 or 3 bytes per pixel), allowing very simple and straight-forward machine vision applications. The user application can access any pixel directly from this memory buffer. The user could program the C-Eye with custom algorithms to capture images, analyze any zones of interested pixels, and make control decision based on that image processing result in real-time. These images can also be saved in Windows bitmap (.bmp) format for easy storage and transfer to the PC for later analysis. Tens of thousands of images can be stored with onboard removable CompactFlash memory cards, using the provided FAT16 file system support. A 4 GB CompactFlash memory card, for example, could store (and be used to transfer) nearly fifty thousand 320×240 256-color/grayscale images. The OVT7640 image sensor makes image data available in several formats: YUYV, RGB555 being the two most common choices. TERN sample code shows how to transform this binary data into either 256-color grayscale, 256-color RGB, or 24-bit RGB bitmap files. 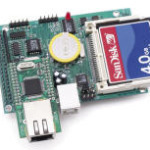 The C-Eye is a complete controller including a 16-bit 40 MHz x86 CPU, onboard regulator, 512KB Flash, battery backed SRAM, 1 MB image FIFO, an image sensor, two RS232 ports and a CompactFlash interface. The onboard 10/100-baseT Ethernet port has integrated hardware TCP/IP support, allowing basic HTTP, SMTP support . If configured with the integrated Ethernet option, the C-Eye can be used as a image-serving web browser, allowing you to download images directly to your internet browser without any additional coding needed. Two RS232 serial ports (SER0 and SER1) can handle 115,200 baud with high reliability. SER1 can also be hardware configured as RS485. There are a real time clock with Battery backup, 10+ TTL I/O pins and 3 16-bit timer/counters. A high speed 16-bit parallel databus expansion header supports external USB interface for high speed data transfer to a PC. 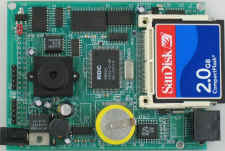 The C-Eye is designed to be used in hard-to-access embedded environments. It accepts a wide range of power inputs (8-35V with the switching regulator), and can be driven directly by battery or industrial power. The standard C-Eye consumes approximately 120mA @ 12V. The optional switching regulator allows the C-Eye to sleep in VOFF mode, and to reduce power consumption to less than 30 uA. The onboard real-time clock can be used for scheduled “alarm” wakeups from VOFF mode, allowing the C-Eye to run indefinitely in any battery-powered environment by controlling how often the camera is enabled for image acquisition. Within 3×4 inches, the C-Eye is designed to fit into an Aluminum Extrusion Enclosure for easy deployment and installation. A Windows-based “C-Eye Viewer” utility + sample is provided for the real-time display of images downloaded from the C-Eye, via RS232 or USB.